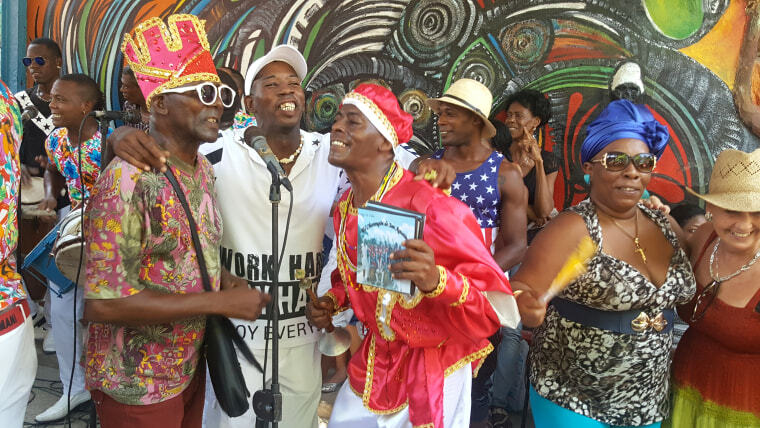 HAVANA, CUBA- Callejón de Hamel (Hamel Alley) — a vibrant street in the Cayo Hueso neighborhood of Central Havana devoted to Afro-Cuban culture —is where Elier Lima first fell in love with dance. “When I went to Callejón de Hamel I saw Afro-Cuban dance and it was so amazing. There were amazing dancers and an amazing show. And for me that was like the step, the important step for getting into the dance world, ” Lima said. This significant cultural space, which also features music, theater and art became the first stage Lima danced son, salsa and rumba before joining the Dance School of the National Theatre of Cuba and the National Folkloric Ensemble of Cuba three years ago. In March, the professional dancer opened Pasion Caribeña dance school on Obispo Street in the heart of Habana Vieja (Old Havana). The school has a variety of offerings, including dance history lessons, daily dance classes for individuals and groups, monthly workshops and Cuba dance tours. As a dance instructor that teaches traditional Cuban dance, Lima’s occupation is one of 201 types of jobs that qualify for government licenses. In other words, he is legally permitted to have small businesses that are “non- state” run by the Cuba government due to what he does. Other jobs that qualify include standard roles like restaurant owner, barber and electrician as well as more unusual ones like Habaneras (women posing in colorful colonial attire) and Operator of Children’s Fun Wagon Pulled by Pony or Goat. “Ten years ago or 11 it was hard to be the owner of your own business… the government was in charge of everything,” Lima told NBCBLK. "Many people were not comfortable with that. Now that I have this business, I want to help other dancers." The 20-year-old cuentapropista, or self-employed person says that the mission of Pasion Caribeña is not only to teach the steps and stories behind different forms of dance like son, salsa and folkloric, but also to improve the economic stability of other self-employed dancers in Cuba. “The only thing I ask them is for two percent [of earnings from each instructor] to put in the fund of the school so that we can pay the rent every month…and, to make the clients feel as a family. Work hard so that they come back and attend more classes. That’s so important,” Lima said. Working with Pasion Caribeña was a welcome opportunity for professional dancer, but first time teacher Janai Stable— one of 10 cuentapropistas, or “independent contractors” working at the recently opened dance school. “For us it was a little complicated before… Now we get paid every month...We can pay what we need to, to [the school] and the government,” Stable said. “This [dance] is my life…. I love when I show dance styles to people. I get to share the Cuban culture. For me it’s a great experience,” she added. The dance school has partnerships with local hotels and casa particulares (private accommodations) as well as a dance school in Switzerland. It also works with U.S. based businesses like Diaspora Enterprise Solutions, which bring groups of American citizens to Cuba on cultural and educational programs. Having both local and international partnerships has allowed Pasion Caribeña to expand its client base rather quickly with students from around the world. “For us it’s incredible. We have people from America now, Germany, Chinese people, Japan, around the world. For us it’s amazing,” Stable said. Lima’s goal is to open two more dance schools in Havana in just a few months and then expand the Pasion Caribeña brand to other provinces on the island. “In three years I have to be as McDonald’s around the world... I think I can do that, but it comes step-by-step,” Lima said.